Fiction – hardcover; Bloomsbury; 152 pages; 2009. 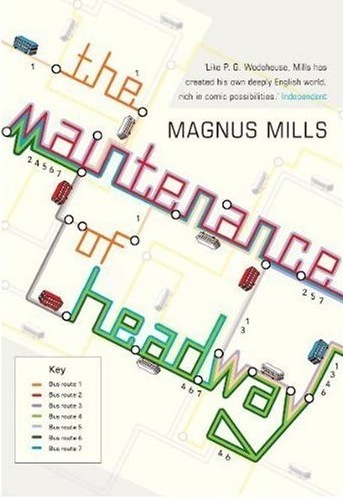 You know you’ve really enjoyed a book when you titter your way through it, which is exactly what I did when I eagerly devoured Magnus Mills‘ latest novel, The Maintenance of Headway. Mills, who is one of my favourite authors, is, admittedly, not for everyone. He writes in a deliberately understated way, with an almost childlike naivety. He doesn’t bother with extraneous detail, because everything moves forward chiefly through dialogue. This allows him to really get to the heart of the matter, which, in most of his novels, is this simple premise: English life is plagued by bureaucracy and officialdom for no other reason than it keeps people in employment. In The Maintenance of Headway, Mills turns his scornful eye towards the running of the London bus network. (Mills himself was a bus driver when his first novel, The Restraint of Beasts, was published.) Well, I suspect it’s London for the city isn’t named, but the description of the street system — “The streets are higgledy-piggledy and narrow; there are countless squares and circuses, zebra crossings and pelicans. Go east from the arch and you’ve got twenty-three sets of traffic lights in a row” — is unmistakable. I’m also convinced that the “bejewelled thoroughfare” (“a great canyon of flagship stores stretching side by side for nearly a mile”) mentioned in the text is actually London’s Oxford Street. As to the story, there’s not really much to it. In fact, it’s pretty much devoid of plot. The book is essentially a satire that pokes fun at the overly regimented (and somewhat unsuccessful) way in which the Board of Transport runs its buses, where “there’s no excuse for being early” and everyone bemoans the loss of the Venerable Platform Bus (which can only be another way of describing the now defunct but rather iconic Routemaster) with its conductors and no doors. It covers the running battle between the bus drivers, who just want to drive buses to their required destinations with a minimum of fuss, and the inspectors, who meddle with the timetables and routes under the guise of “maintaining headway” . ‘Tough, isn’t it?’ said Jason. If you’ve ever experienced the joys of being a bus passenger, there’s a lot in this funny little novel you’ll recognise. And next time you wait ages for a bus and then three come along at once, you’ll know exactly who to blame. I loove Magnus also. I must meet him one day. Jason reminds me of something that happened to my sister and I when we were in high school. We rode the streetcar (trolley) to school everyday. Many car drivers cut in front of this massive structure and expect the driver to have a quick reaction and apply the brakes. Well, our conductor for that day was retiring the next day. He had had it with the reckless drivers, so when a car cut in front of him, he didn’t stop. If a streetcar stops working, all the streetcars going in that direction can’t proceed. So, my sister and I had to walk the rest of the way (about 30 short blocks). The nuns almost didn’t believe our excuse for being late to school. Oh this sounds utterly wonderful. I am definately going to be looking out for this one. I do like books which are very coversational, nothing much has to happen its the conversations that contain all. I now totally see why you were raving about this last night! Isn’t the cover wonderful too! He’s an acquired taste, but I find all his books delicious! This one does lack a definite plot, but it’s very funny all the same. Funnily enough, I’m not convinced by this cover; I thought it was a bit drab. I would have loved to have seen a big red bus on the front! I love his books – this one is nearing the top of my TBR pile, so I’ll get to it soon I hope. On the face of it his books are gentle comedies, but underneath there is real satire, and I chuckle all the way through. I loved the circular premise in ‘The Scheme for Full employment’ which was wonderful and bizarre, yet you could believe that someone in Government would really come up with it. Do you mean to say he just smashed into a car that crossed his tracks? Wow. Didn’t anyone get hurt? I think they’re probably quite subversive, really. As you say, they have the appearance of gentle comedies, but look a bit deeper and they’re actually quite scathing satires about some facet or other of English life. I’ll never forget All Quiet on the Orient Express and its portrayal of idyllic village life as something much more evil. I read this one too recently and thought it very funny. I also recommended it to a colleague whose husband is a retired bus driver and he thought it was spot on. He was going very slowly (5-10 miles/hour). The car door got smashed. My sister and I had a feeling that he wasn’t going to stop, so we braced ourselves for impact. Since we weren’t hurt, we stepped out and walked to school. The conductor didn’t stop us. He really didn’t care at this point. We overheard that this was his second crash of the day, after having a perfect record for more than 20 or 30 years on the job. Oh yes, I imagine anyone who’s driven a bus for a living would love this! Great review! Mills is one of my favorite authors as well. I hope to read Maintenance soon (although I don’t see it on Amazon; maybe it hasn’t been released in the US yet?). Typical Philistines, always behind on great art. I’m just reviewing this and have linked back to your review – I wish I’d enjoyed it as much as you did, and would love recommendations for which Mills I might *get* better! Simon, I think he’s one of those authors you either love or hate. Admittedly, this is not one of his stronger novels. Perhaps you might like All Quiet on the Orient Express, which has a proper plot and builds up a lot of tension. It’s on my wishlist now… I didn’t love or hate Mills, but simply quite enjoyed it – I felt that I *could* love him, if I found the right book.